Only 13 percent of Swedes reported using cash for a recent purchase in 2018, according to a nationwide survey, down from around 40 percent in 2010. In the capital of Stockholm, most people can’t even remember the last time they had coins jingling in their pocket. By contrast, around 70 percent of Americans still use cash on a weekly basis, according to a recent study for the Pew Research Center. 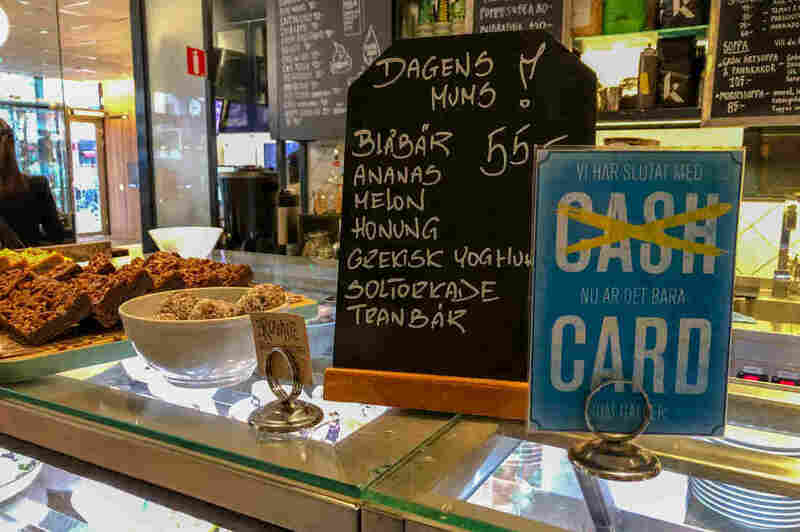 In Sweden, however, especially in the bigger cities, going cashless is becoming the norm. Purchases usually happen as digital transactions — by card, online or with Sweden’s most popular mobile payment app, Swish. The trend has spurred Ikea to test making its store in Gävle (about 100 miles north of Stockholm) completely cash free. And Åhlens, the country’s largest department store chain, is also experimenting with the concept in some locations. Buses and trains no longer take bills or change. Nationwide rail company SJ has even started allowing customers to store digital tickets on microchips in their hands. “If you go to a bar or if you go to some shops, they say to you that the only way to pay, is to pay with cards or this Swish system,” explains 75-year-old Christina Tallberg, who is president of Swedish National Pensioners’ Organisation. Another concern is that the majority of local bank branches have stopped letting people take out cash or even bring cash in to the bank. Even Sweden’s central bank — the Riksbank — which largely supports the transformation of the country’s payment system, has also argued that going completely cashless can be risky. He said that many of those working in the financial sector have been “taken by surprise” at the speed at which Sweden seems to be phasing out cash. A big reason why Sweden has moved more quickly to becoming a cashless society than other places, is that the country is also considered a pioneer in digital technologies. Strong broadband coverage, even in remote areas, and a small, tech-savvy population of just 10 million have contributed to the cashless trend picking up more quickly in Sweden than elsewhere. Meanwhile, businesses have been keen to get rid of coins and notes since a string of high-profile robberies in the early 2000s, that got unions campaigning for cash-free workplaces. Also, a lot of Swedes just have a deeper trust in both institutions and new technologies. That has delayed public debates about digital security, compared to other nations, where populations are more wary of state or company surveillance, according to Dr. Claire Ingram Bogusz, a researcher at the Stockholm School of Economics, who studies digital payment systems. “Ordinary Swedes are not concerned at all. The convenience of having your bank account, your money at your fingertips and increasingly on your smart watch, vastly outweighs any concerns that they have about security or about being tracked,” she says. However she points out that the recent Cambridge Analytica scandal, in which a personality profile test scooped up Facebook user data for political research, has made more people aware of how their data could be used. Also, advocacy groups are becoming increasingly vocal about the potential downsides of a cashless society. “There is a very, very large number of people who … don’t think that the state should be trusted as blindly as many do,” Bogusz says. A parliamentary committee is studying the impact of Sweden’s falling cash use. And lawmakers are exploring how well the country could handle digital payments in the event of potential server or power or hacking. Last year, the government issued a leaflet to all Swedish households, advising them to put some cash aside, in case of a national crisis or even war. Meanwhile Sweden’s central bank is testing out a new state-issued digital currency — the e-krona — which it hopes could be less vulnerable to attacks — by being independent from global payment systems like Visa and Mastercard. “I like the idea of having cash myself, but also having money in a bank… and using both ways of payment,” remarks Annabelle Nowak Bråberg, 19, who was studying with friends back at Urban Deli. “Last week, I had lost my card and I had to order a new one, so I had to take out some cash,” Nowak Bråberg said.